Well my gear is lying in a small section of floor neatly aligned so I can see and review every little piece, waiting to be decided whether I need it or not. My stock of camp food filling a plastic bin large enough for me to sit down in, waiting to be sorted into a big bag for my first 4 or so days. My manager has begrudgingly accepted yet another of my many vacation requests. I leave early on June 4th. The Lake Okeechobee Lollipop Trail is a go! The Lake Okeechobee Lollipop Trail. A small route I’ve decided upon and dreamt up including the Lake Okeechobee Scenic Trail(LOST) and the Ocean to Lake Hiking Trail(OTLHT) combined. (Could be considered the Ocean to Lake Hiking Trail – Hard mode.) Using your imagination the map resembles a lollipop, and thus leading to such a name. Really, in my head before looking at maps I thought it would be a more clear picture of a Lollipop than it is. Anyhow, the LOST is 110 miles around, and is usually tackled in day hikes or by bikers. There may even be an ultra-marathon that navigates the circumference. Lake Okeechobee is the second largest lake in the lower 48(after Lake Michigan.) I’ve been thinking for a while now how cool it would be to walk around the entire thing. The open space, the daily sunrises and sunsets it has been on my mind as a “need to do” for the last year. It covers 730sq mi, and is roughly half the size of Rhode Island. Certain sections of it (almost the entire south side) are closed while the Army Corps of Engineers maintain the Herbert Hoover Dike for an undetermined amount of time into the future(they say 2019.) So not only is the trail designated the acronym, LOST, I too hope not to get lost while doing an added 30 or 40 miles walking around the closed section in small towns, and along big highways. I’m looking at this as a way to experience towns I have likely only driven to or knew a guy who knew a guy who said to never ever go there. Like Belle Glade(that place sure does get a lot of heat, lets find out why.) I also fancy this trip for… its road walking. That’s right, I’m actually looking forward to it. When I first came up with this idea a while ago that was my main driving factor before I even considered the views or the experience of this journey. The fact that I’ll get to walk upon hard ground for such a long time, and still have places to camp freely is a great opportunity to see how well I can take care of my feet and maybe learn and practice a few tricks while walking harsh terrain daily at a fast pace. Most of my hike during the lake section of the lollipop will be on top of the dike which will offer great surrounding views being it’s elevated for flood protection. Such open flat space may not be to hard to find in Florida, but views of the lake, and endless skies to either side of me without buildings to obscure my view will be a daily treat. My favorite local trail is the OTLHT. A route that leads you from the Atlantic Ocean starting at the Hobe Sound Beach, and takes you directly to the Lake Okeechobee Scenic Trail. It is pretty clear why I would want to add this to my trip and form the lollipop shape. Although when first thinking of doing the Lake O hike I hadn’t considered this, but as time went on it became without question something I would add to the trip. 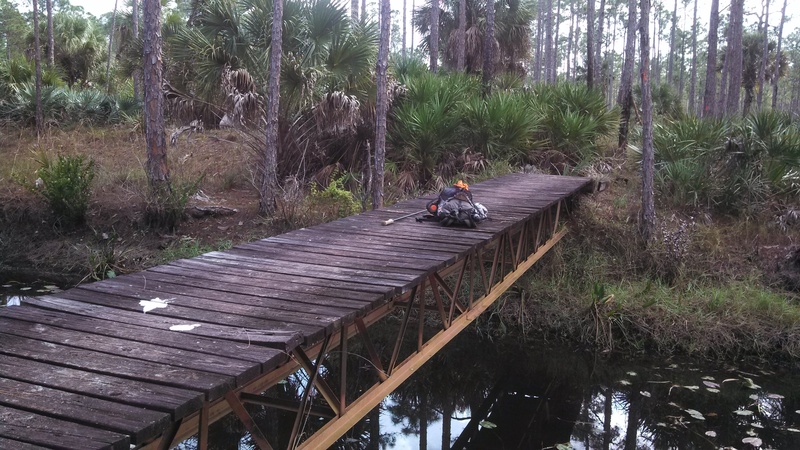 The OTLHT is a great jumping off point to get to the Florida National Scenic Trail, and some serious fun and wilderness experience on my way to the big open loop. The two trails will contrast each other nicely as I’ll be be walking in the wilderness for a few days, followed by the great expanse of the lake, and end again on that wilderness corridor. I will be starting and ending at the Hobe Sound Beach in what I assume will take 9 days for the whole trip at a pace of around 28 miles a day. About a marathon a day, give or take, for 9 days. I’m flexible with this as my physical health comes first, but that being the ideal average and the average I’m not only comfortable with but happy with. I know the Ocean to Lake very well and am excited to do it for my 11th and 12th time, having it be the start, and end of my 250mi journey. Not to mention beginning and ending on the beach a feature you won’t find on many hiking trails. A fitting end to a very long and hot walk. If you’d like to get out and do it yourself I wrote a Q&A on such a trip. The Ocean to Lake Hiking Trail is 63 miles and goes through Jonathan Dickinson State Park, Riverbend Park, the Loxahatchee Slough, Hungryland Slough, Corbett Wildlife Management Area, and Dupuis Wildlife Management Area–ending at the dike of Lake Okeechobee where the LOST begins. It’s a whole lot of interesting environments, habitats, and ecosystems that are exclusive to Florida packed into a shorter thru hike. It’s 250 miles for the OTLHT twice, LOST, + my reroutes. I have a planned 9 day itinerary but this may take me 8 days or 10 days depending on how I’m feeling and how the trip is going. I’m more into fastpacking you could say than typical backpacking as I set out to walk far, and enjoy the hike all day. I like waking up before sunrise, and setting up camp at sunset as opposed to going a short distance and enjoying the camp life for the majority of the day. It’s a style of backpacking that works for me, and I love very much. This style allows me to cover great distances in an overall shorter time. My days may be longer but I’m able to do the Ocean to Lake twice in the extra time that most would still be circumnavigating the Lake Okeechobee Scenic Trail. More importantly doing big miles lets me do some of these nasty road walks in one day rather than not being able to do them at all or having to find a place to sleep halfway through. Although It’s more important that I finish the hike than do my planned miles so my physical being comes first, and I will try to remain flexible along the way. Some days are set in stone as I am only carrying so much food in between resupply points but I usually carry more food than I actually need so in the end I’ll be ok regardless of what I choose to do on trail. I’m also limited as to where I can camp in the southern half of the lake because of the closures on the trail so most of that I’ll likely blow through in a single day as I mentioned. Day 1: Starting at the Hobe Sound Beach and be walking at or before sunrise, hike through Jonathan Dickinson State park and Riverbend Park leaving me with the option of camping at the Loxahatchee Slough campsite or pushing on. I will most likely push on as stopping in the slough is not quite far enough. I think it’s 19 miles from the start and that’s a little short of where I’d like to be that night. I plan on camping in Corbett and covering half of the OTLHT on day one as Corbett is a challenging section that I’d like a full day to get through. Day 2: From the Youth Camp in Corbett which I’ll be camping a few hundred yards from at the Hungryland Boardwalk trail head I’ll make my way through the drying swamp and wetlands 16 miles to the border of Dupuis WMA. Normally Dupuis has plenty of water around but during this time of year it’s rather dry so I’ll be going further to fill up at the pitcher pump in Loop 4 Campsite making this a 22 mile day, but day 3 is when the road walking begins so if possible I’d like to once again go further and pitch my camp for the night as close to Lake Okeechobee as I can in preparation for a long day ahead. Day 3: The roadwalking begins. I’ll actually be running into a large group of ultra-runners who are doing the OTLHT in less than 18 hours while I’m still in Dupuis this morning. When reaching Lake O I will be going south on different highways walking in the grassy shoulder. Passing through Canal Point, Pahokee, Belle Glade, and eventually camping at the wonderful(coughcough) South Bay Campground. It’s 23 miles from the western terminus of the OTLHT to where I’ll be staying. I hope I can wash up and maybe steal some electricity there for my phone as it is my only device for photography. Day 5:Finally on the Scenic Trail I’ll be walking toward the town of Okeechobee and camping somewhere around there or just beyond at one of the campsites along the lake. Okeechobee is another potential resupply as there is a Publix just off trail a few miles. I also have friends that have offered there assistance but I think my waking up at 5am thing kind of negates wanting to stay with them for a night. Although I very much appreciate the offer I gotta make my miles! Day 6: Walking another 20+ miles on the Lake Okeechobee Scenic Trail to round up the loop and get back to the OTLHT I’ll be camping in Dupuis WMA and beginning my trek back to the beach! Day 7: Camping in Corbett most likely at Bowman Island Campsite. Day 8: Possibly camping in Jonathan Dickinson at Kitching Creek Campsite if again I wish to hike past the Loxahatchee Slough Camp. If for some reason you would like to join me for any of this–please, contact me beforehand as a small change of plan could mean we completely miss each other. There are a few things I’ve had to wrap my head around before I leave. Being that I’m impatient and don’t want to wait for nicer weather to go backpacking I will be doing this trail in early JUNE. This leads to complications that wouldn’t typically be nearly as big a problem. There’s a good reason people fly down to Florida in the winter months and then go back to their northern homes when summer begins. Florida is a gnarly place in the summer months, between the blistering heat and the scattered storms there’s only one activity on peoples minds at this time of year… the beach. I have a different idea of fun i suppose but mostly I don’t wish to be limited when I can go backpacking. Much like hiking in the winter up north, hiking in the summer in the south brings its share of challenges to over come. There’s just a lot less documentation on how to deal with them in comparison to winter backpacking. Isn’t this what backpacking is about anyway? Being prepared for what’s ahead of you? Here’s a few things on my mind when it comes to possible adversities I might face on this walk. Easiest of which being the heat. I’m used to it for the most part, but most importantly I’m used to dealing with it. I’ve lived in Florida all my life, and have been backpacking in very hot weather for quite some time now. I know what I can bring and what I can do to prevent problems like heat stroke and dehydration. My number one tip is to get a sun umbrella. You might think it’s silly, but I will tell you I use mine day after day, hour after hour while walking under the suns rays. The shade and comfort it provides is unparalleled especially on a trail like the LOST where shade is at a premium and there are very few trees to escape the sun. Sometimes I’ll soak my bandanna in water and put it on my head or do the same with my t-shirt, this helps to lower your body temperature. Carrying electrolyte mixes to add to my water, and drinking frequently will be the name of the game in such hot weather. I also like to start hiking sometimes as early as 5:30am until well into the dark on these types of trips so that plays to my advantage while hiking this route in the summer. Utilizing the mornings and nights can play a big role in avoiding the most harsh times of the day. Lightning is another concern. My plan is to simply stay as vigilant as possible and seek refuge whenever possible if a big storm should arise. Keeping in mind that most people don’t die–they are granted super powers when hit. Contrary to what the movie portrays, Peter Parker was hit by lightning only to wake up finding he was Spiderman. Same story with the Hulk and Magneto. Don’t get me started on Storm. Most people are only granted the power to taste copper, whether they want to or not. In my area we haven’t been experiencing nearly as much rain as I thought we would at this time of the year. It’s comforting to know that there’s a possibility that I may not have any problems at all. In addition to that–most storms seem to pass within just an hour so that is to my advantage. Should be fun either way! Route finding may not be very difficult on this trip but I certainly don’t wish to go up the wrong road when going around the southern closures on the lake. I spent a few hours on google maps the other day printing out sections of “trail” that I think may be troublesome. As In, I’ll be turning here or there’s a bakery over there. Important things I don’t want to miss. A kind FTA member lent me an old booklet on “The Big O” and its full of useful information, and I’ll have that with me as well. Problems that can be solved before they even arise are the best kinds of problems. So I’m coming prepared in regards to maps. Maybe I’ll burn them or something as I go. If only I was carrying a lighter. The Lake Okeechobee Scenic Trail would actually be really easy navigation wise if only they weren’t doing work on the dike. It truly makes things more difficult, and for most it makes enjoying these areas an impossibility. As my friend Wayne jokingly said, “this is the Advanced Ocean to Lake Hiking Trail…” Well, I’m always trying to challenge myself in a new way and this trip offers a lot of new challenges to me. I actually wanted to walk across the state of Florida from East to West, but I’d rather save that for nicer weather, and this was number 2 on my list. I’m interested for a lot of reasons. Mostly that I’ve lived really close to Lake Okeechobee for a very long time, and it’s a damn big lake. When you look at a map of Florida it is without a doubt the most noticeable feature from above. Why wouldn’t I want to say that I’ve walked the circumference? Not many people have walked around it in one go without help I would imagine. Probably because they don’t see the beauty in such a trip, but I do. I like to think that Florida has a subtle beauty, and living here I’ve grown to appreciate it. To be out in such wide open space for days, to walk through small central Florida towns, to get rained on without a care, to push myself in ways unlike all of my last trips–this is a step up in both adventure and distance. It’s something I’m really excited to do. I can’t wait to get onto the OTLHT again, and to eventually see that lake, and see what I got myself into! I can’t wait to wake up to the birds and walk with the changing skies, to suffer and thrive both at the same time, to live differently than everyone else. To be away from people on some route walking, walking, walking. This is going to be an awesome hike. I can feel your anticipation. Wish I could go too! May the force be with you dear nephew. Such a cool cool idea . Your articles will make a good book someday. I’m sure it’s gonna be an epic and difficult adventure! Can’t wait to here the tale and see pics when you are done!